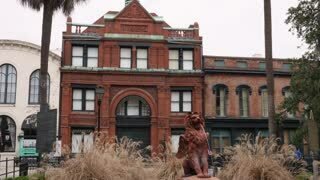 Search Results for "savannah georgia"
SAVANNAH, GA - Circa February, 2018 - A daytime overcast exterior establishing shot of the Savannah Cotton Exchange building on E Bay Street in Savannah, Georgia. SAVANNAH, GA - Circa February, 2018 - A nighttime view of the stores, people, and traffic on busy East Broughton Street in the tourist district of Savannah, Georgia. SAVANNAH, GA - Circa February, 2018 - A nighttime exterior establishing shot of a typical corner business, bar, cafe, restaurant or souvenir shop in downtown Savannah, Georgia. Day/night matching available. SAVANNAH, GA - Circa February, 2018 - A night exterior (NX) establishing shot of tourists visiting River Streets Sweets Candy Store in Savannah, Georgia. Day/night matching available. SAVANNAH, GA - Circa February, 2018 - A daytime exterior establishing shot of a typical corner business, bar, cafe, restaurant or souvenir shop in downtown Savannah, Georgia. Day/night matching available. SAVANNAH, GA - Circa February, 2018 - A daytime exterior (DX) establishing shot of tree-lined Forsyth Park in downtown Savannah, Georgia. SAVANNAH, GA - Circa February, 2018 - Colorful trolleys carry tourists on the historic, tree-lined streets of downtown Savannah, Georgia. SAVANNAH, GA - Circa February, 2018 - A daytime exterior (DX) establishing shot of the icon water fountain in Forsyth Park in downtown Savannah, Georgia. 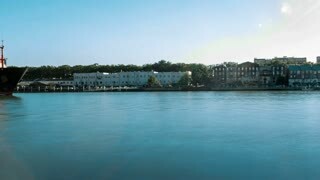 SAVANNAH, GA - Circa February, 2018 - A daytime exterior (DX) establishing shot of tourists visiting River Streets Sweets Candy Store in Savannah, Georgia. Day/night matching available. 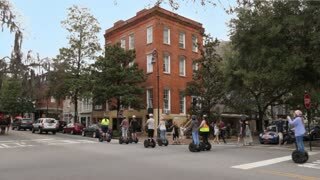 SAVANNAH, GA - Circa February, 2018 - A daytime exterior establishing shot of a typical street corner in downtown Savannah, Georgia as tourists on Segway scooters pass by. SAVANNAH, GA - Circa February, 2018 - A night establishing shot of the SCAD Theatre on East Broughton Street in downtown Savannah, Georgia - Landmark local playhouse with iconic marquee presenting classic films & live concerts since 1946. SAVANNAH, GA - Circa February, 2018 - Cars travel up narrow cobblestone streets in the historic tourist district of Savannah, Georgia. SAVANNAH, GA - Circa February, 2018 - A daytime exterior establishing shot of tourists, pedestrians, and traffic on a typical downtown Savannah tree-lined street. SAVANNAH, GA - Circa February, 2018 - A daytime exterior (DX) establishing shot of the Savannah city hall building. SAVANNAH, GA - Circa February, 2018 - A dusk exterior (DX) establishing shot of the Savannah city hall building. SAVANNAH, GA - Circa February, 2018 - A night establishing shot of a typical downtown Savannah bar or restaurant. Tourists pass on the sidewalk, patrons enjoy dinner outside. Church steeple in distance. SAVANNAH, GA - Circa February, 2018 - A daytime exterior establishing shot of the Independent Presbyterian Church of Savannah. SAVANNAH, GA - Circa February, 2018 - An evening exterior establishing shot of a typical downtown Savannah bar or restaurant. Tourists pass on the sidewalk, patrons enjoy dinner outside. SAVANNAH, GA - Circa February, 2018 - A nighttime exterior establishing shot of the flashing marquee on the Savannah Theatre, a historic theater established in 1818 featuring a diverse line-up of musical plays and shows. A daytime outside exterior (DX) of a typical upscale Savannah, Georgia red brick home. Front entrance, American flags on porch. A daytime outside exterior (DX) of a typical upscale Savannah, Georgia row houses. Traffic passing, near a town square park. 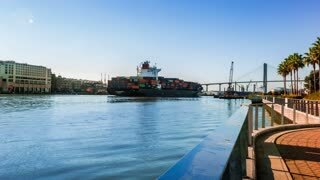 SAVANNAH, GA - Circa February, 2018 - A tug boat guides a largo cargo ship down the Savannah River on an overcast day. Shot at 60fps. An aerial of a cargo ship in the intercoastal waterway near Savannah, Georgia heads out to sea. SAVANNAH, GA - Circa February, 2018 - A closeup shot of a tug boat guiding a largo cargo ship down the Savannah River on an overcast day. Shot at 60fps. A view of two bicycles parked on the sidewalk on a street at night in the tourist area of Savanna, Georgia. A daytime outside exterior (DX) establishing shot of a typical tree-lined park or town square in downtown Savannah, Georgia. 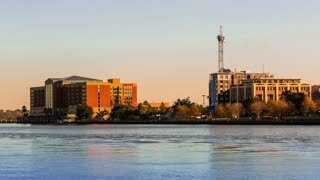 SAVANNAH, GA - Circa February 2018 - Tourists board a riverboat on the shore of the Savannah River as a tugboat passes by in the distance. 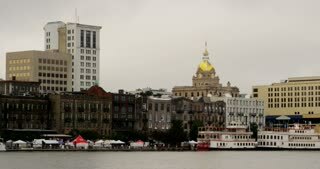 A daytime overcast exterior establishing shot of a white building in Savannah, Georgia. Can be used as a home, residence, or bed and breakfast. 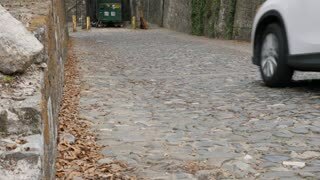 A car travels down a narrow cobblestone street in the historic tourist district of Savannah, Georgia. 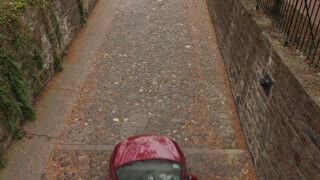 Overhead view of a car traveling up a narrow cobblestone street in the historic tourist district of Savannah, Georgia. Savannah, GA March 9: Gerogia Queen riverboat on the Savannah River on a tourist tour March 9, 2013 in Savannah Georgia.